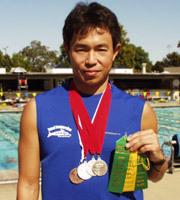 Shinji Takeuchi, born in 1965, has no experience in competitive swimming. Although he learned how to swim in his childhood, he did not swim as his regular exercise until he decided to start swimming in 2002. His doctor recommended him to exercise to lose weight, and the only sport he could do was swimming. He tried to swim for more than 15 minutes to burn more fat, but was unable to. He decided to learn to swim in a proper way and found Total Immersion videos. After one year of practice in the TI way, he lost 18 pound. Moreover, he could swim faster, and many people in the pool started to call out to him about his graceful swimming. He found Total Immersion's learning process highly effective and started to teach Total Immersion Swimming in Japan in 2005. Now there are more than 100 certified TI coaches and 4,000 workshop attendants in Japan. The combined units of DVDs and books sold exceeds 30,000. Shinji has developed 26 original DVD titles, and he has created 30 kinds of workshops (one or two day group lesson) in Japan. Shinji's YouTube video has got more than 9 million views, and it is ranked as No.1 worldwide among popular swimmers.